What I would however like to make a brief statement on, is the seemingly unusual language that is being used by Workers Party member and MP for Aljunied GRC, Sylvia Lim, when debating the paper in parliament. Specifically, I would like to suggest that she, her speech writers and/or her PR team seriously consider the impact of her words. "Madam Speaker, instant citizens can be Singaporean in name and have all citizenship rights, but for the Singapore core to be strong, the core must be strongly Singaporean in values, worldview, culture, sense of place and history, and network of friends and family. This can only be cultivated over time, in institutional settings such as schooling, national service and community service. A strong Singaporean core should be made up of Singaporeans who grow up in and with Singapore." Firstly, coining the phrase 'instant citizens' as opposed to 'new citizens' could actually be considered quite demeaning to those committed to Singapore, who have often moved halfway across the globe, renounced their country and birth-right and have gone through the required due diligence and process required to pledge allegiance to their new home (in many cases, having lived here for the lion-share of their lives). 'Instant'? - I think not. If, and when, we decide to personally apply for citizenship of this wonderful country we call home, personal sacrifices would need to be made, my current citizenship and any allegiances would need to be denounced... this, along with the many years of dedicated community service and integration efforts already undertaken, would not be an 'instant' decision, nor if we were honoured enough to have the citizenship application approved, would it in any way be 'instantaneous'. If history shows us anything, it is that providing 'labels' that potentially attempt to incite divide (in this case between 'true blue' Singaporeans and instant new citizens), is often a very dangerous road to travel and diverts attention and emotions away from the real issues at hand. On another related note, when I asked the question, "If an instant new citizen gives birth to children (SG citizens) who are 'cultivated over time' through institutional settings such as schooling, national service and community service, is this not in line with Sylvia Lim's vision of the 'Singapore core'? ", I was told that it requires the lessons of previous generations and cultures handed down to create the 'Singapore core'. This is quite interesting - I remember back to an integration workshop I attended a few years ago, where over half of the 300 attendees were citizens, the moderator asked everybody to stand. He then asked all those not born in SG to sit down - a lot of the crowd obliged. He then asked for anyone with at least one parent who was not born in SG to sit down - around 25% of the audience remained standing. Finally, he asked for anyone with at least one Grandparent not born in SG to sit down... one sole individual remained standing out of the entire room... the moderator then asked the 'rhetorical' question - 'What makes me a true blue Singaporean?... how many generations does it take?'. So I pose the same 'rhetorical' question to Sylvia Lim (no need to answer) - how many generations does it take for children or grandchildren of instant new citizens to be accepted as part of the 'Singapore core'? Anyway, don't get me wrong, I sincerely wish Sylvia Lim all the best in her efforts in parliament. I strongly believe that having the ability to bring different viewpoints to debates such as this one on the population white paper is extremely constructive and can only bring about good things for any democratic country. Well you seem offended as you are an instant citizen as well. It takes one to be born and raised in S'pore to be considered a 'core' S'porean. An instant citizen wouldn't even understand what it means to be a S'porean even if they tried. Well, then I think the right thing is to pose the question to the PAP - specifically TCH, what he means by "Singaporean Core". Afterall, they coined the term and word. And many parents and NS men spending 2 years of their prime life want to know what that means too! Our great-grand parents came from China, Arabia, Malay Archepelago and India 100 of years ago. Technically, it takes abotu 2-3 generations before they get infused into a big family and culture. Acceptance is mutual. It is not about living together on a same land but also toil and sweat and perhaps bleed together for our survival on the land. Will the new citizens stay and fight together with the natives when crisis occur? It is something we will always ponder about. Likewise, I am also interested in what or how PAP define their take on Singaporean "core". Would you take up arms and fight for this land if the need arises? Why are you a SG PR? Do you wanna be a SG citizen? Why is your blog AussiePete? there is absolutely no need for such new citizens to even take her comments into regard, because these are not the people she is referring to. Perhaps you are unaware, but there ARE plenty of 'instant citizens' in Singapore, who see the country as nothing more than a stepping stone, taking advantage of our government's ridiculous policies that almost practically begs them to do so. Many of these 'citizens' have no desire to commit to the country, let alone integrate and share our culture. Their 'efforts' to gain citizenship too are hardly evident because many of these individuals have long decided to abandon the citizenship of their home country, primarily due to bad conditions, and neither do they actually want to settle down in Singapore as their permanent destination. Sadly, many of such individuals are actually almost invited to take up citizenship, making them the 'instant citizens' Sylvia Lim was referring to. They are absolutely not referring to the sincere migrants who wish to settle down here and make this country their home. MP Sylvia Lim is simply trying to remind the government that attempting to increase the population of Singapore by generating 'instant citizens' via reckless immigration, accepting simply anyone who wishes to come in, with no efforts to even remotely gauge their intentions and abilities to contribute; will result in the core values, culture and heritage of Singaporeans to eventually disappear. I believe she has no intentions of belittling the efforts of committed new citizens who wish to contribute and eventually form this 'Singaporean core' that gives us our identity that is dangerously close to disappearing. As an Aussie you can always get your citizenship back whereas Born and bred Singaporeans who gave up their citizenship cannot. becos their passports are an inconvience to them, they can't travel to any country without getting a visa. I am in Canada and a pinoy told me this , yes there are many filipinos in sgp but they are here to get PRs to australia, canada, NZ etc becos it is very difficult to apply for PRs in their homeland and it is much easier with a singapore citizenship. These ppl who come here do not respect the Singpaore laws, way of life, our language, customs. Unlike immigrants who go to Australia where they do their best to integrate and respect your country becos they treat your country as their home, they felt thy have 'made it' when they get a PR in Western countries. Here the immigrants do not treat Singapore as a home this is only a halfway house/ a stepping stone/ a hotel for them before they move on. 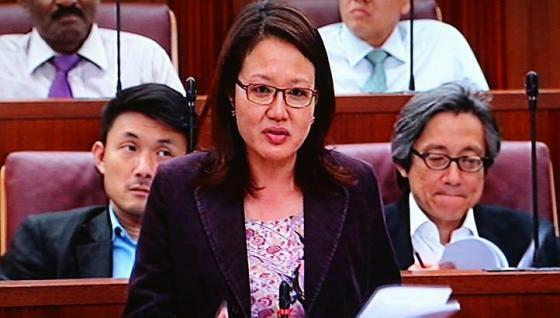 What Sylvia Lim says represents the sentiments of the majority of the sgpreans. If you are a PR who really wish to understnad and assimilate into the society perhaps you may want to try and understand why she makes such statements and make an effort to understand the concerns of the sgporeans. Yes this probably only applies to ppl with citizenship from AUstralia, US etc. ppl from India, Phillipines, China can't wait to give up their citizenship for a passport that allows them travel to any country without restrictions as opposed to their own country's passport where they are required to get a visa to travel anywhere. I am in Canada and a pinoy told me this, there are many filipinos in sgp and they are there becos they can't get into any western countries when they were in Phillipines so they get a singapore citizenship and then apply for PR to the western countries from singapore becos it is much easier to do so with a singapore citizenship. Unlike immigrants who migrate to Western country, Immigrants here do not respect the singapore way of life, our customs, our culture, our langugage they do not make any effort to integrate becos they do not see Sgp as their home , sgp is only a halfway hse/ a stepping stone/ a hotel for them. their final destination is a western country - US, Canada, Australia, NZ etc. If you are a Singaporean how would you feel, to see these ppl coming here to take advantage of your country? By writing a blog piece about what Sylvia Lim said about "Instant Citizens", you have already stepped into the debate of the Singapore Population White Paper. Something you mentioned specifically in the first paragraph that you did not wish to enter or participate. You are a foreigner, regardless of your resident status. Until you live and know the daily struggles of the average Singaporean, live as in earning a local salary and not some extravagant expat package living in a condo, you will never understand the frustrations of these "Instant Citizens" that are causing major grief amongst Singaporeans. Your blog post only shows your ignorance, young one. Stay in Singapore for more than 20 years. Marry a Singaporean girl and have sons who will serve the army, then I will respect you and your views a bit more. Like many others, I also do not understand why you preface your commentary with the first paragraph. You clearly ARE entering the debate about the Singapore government's white paper. You enter the debate by commenting on a particular MP's words of opposition to the paper. Of course, I find it perfectly okay and even admirably that you want to contribute to the discussion. I am just confused why you are at pains trying to say that you are not. What else are you doing if not entering the debate? As usual you've written from the heart and always concerned of feelings of others. As usual I'm both amused and disappointed by some of the comments of my fellow Singaporeans. Some very ignorant try and tell what person you are. They don't know your two boys born and bred in Singapore, that you live in HDB, that you well loved in your community and that you are a passionate grassroots leader and active volunteer in CCMC and CDWF raising money for needy Singaporeans. Instead they just see the colour of your skin and that your a foreigner. But we all know who you are and where your heart lies - God bless you, Sammi and the boys. You are an inspiration to the majority of us and don't need to worry about ignorant few. Why are there so many Workers Party fans who read your blog? They are an extremely sensitive bunch. The slightest criticism of a WP politician and they are up in arms. They are also very presumptious, accusing you of living in a condo on an expat package, etc. One has even called you "young"! Don't mind them. The majority of Singaporeans are decent and fair-minded. You have raised a good point in your blog and reasonable people understand what you are saying. Who is the person who said this rubbish: "our great-grand parents came from China, Arabia, Malay Archepelago and India 100 of years ago. Technically, it takes abotu 2-3 generations before they get infused into a big family and culture." Technically? What technically? Is there some sociological study that proves this? I'm born in Singapore and I did my NS here. Are you saying I am not infused with Singapore culture just because my mother was born in Malaysia? You guys are really prejudiced. Immigrants are usually not integrated to be the core citizens of any country. This is true for any nation. For example, immigrant Asians into USA are not integrated well as Americans BUT their children who are born, bred and educated in the States becomes the 1st generation Americans. This is a fact for all countries. Pete just have to accept this - only his children, if they experience the full spectrum of the Singaporean life, will identify themselves as 'Singaporeans'. I have also personally seen this in many immigrant friends of mine - the parents and children have different national identities. The blog entry by Pete shows that he has several lapses in the Singapore experience bcos he basically, isn't born and raised here. Since you think you have what it takes, then you should ASK YOURSELF how many generations it will take for you to speak Singlish every single day like I do and have the ability to speak in Hokkien with hawkers ( i aint a hokkien). When you have the answer, you will know the response to that question you posed when you signed off in this article. Well, Sylvia is referring to those newcomers who are granted citizenship within months or a few years, especially those with million$$$. If you have been here for decades and decide to take up citizenship, then obviously you are not instant citizen, but new citizen or naturalized citizen. Yes, "instant citizen" is meant to be demeaning and as a slap to the government's cheek. Just like instant trees which topple when there are heavy rains. I am a male, born here, bred here, served NS as an officer, still doing reservist and working in S'pore. I get your point; to define how true blue you are by how many generations before you are born in S'pore is absurd!! Can anyone define what is a S'porean?? My grandfather will define it differently from me. I say screw the definition, taking up citizenship welcomes you into the same boat as us. However, I say to those that just want to retain their PR statuses.....don't pretend to call Singapore your home. Don;t expect to have the same benefits of a citizen. Fair? You are just being offensive. I was born here and I serve my NS too. But I don't speak Singlish and I don't speak Hokkien. Are you saying that I am less of a Singaporean than you? You and the other xenophobes are dangerous when you mouth off about how it takes generations to become a Singaporean. What about Chen Show Mao? He wasn't born in Singapore. Is he any less Singaporean than you? You guys are an embarrassment to our nation. BTW your children have dual citizenships? What I like about you Pete, is that unlike many other Westerners over here (including Aussies), you have a deep respect for our way of life, culture and you do your bit to integrate as much as you can. Haven't met too many of those types, the only other person I know just like you is another Aussie chap I met recently from Perth, who seemed to excited about everything in S'pore despite being here for years. What I dislike though is this : You still haven't done your best yet. As long as you remain an Aussie and a PR over here, you are still going to be a foreigner, an outsider. You can't have it both ways. You've planted your roots here, your'e committed to our country, your kids are being raised over here, yet you choose to remain an Australian? A safety net perhaps? Or issit just a mental block against taking on a new identity and renouncing the old one? I'm not going to go into what the Singaporean Core is. But those of us who are part of it, think alike, have similar lifestyles, attitudes and a sense of brotherhood that's been forged over years, regardless of whether we are of the Chinese, Indian or Malay stock. I'm of Indian descent myself, but my family has been here before the 2nd World War, and my forefathers have contributed loads to Singapore just as I have done. That goes for everyone else in the Singaporean Core. Instant citizens, yes, it's instant citizens and not new citizens ( the citizenship process in Singapore isn't as difficult as you make it out to be. Nowhere near the sacrifices real Singaporeans have made to build this nation ), mostly have questionable allegiance and frankly most are here to use Singapore as a springboard to other places in the West. Simply put, most don't deserve to be here and we are not going to call them Singaporean. As for yourself mate, you are not even one of us. You are Australian, period, so by right you shouldn't be engaging in discussions like this. First renounce your Australian citizenship, continue with your efforts to integrate, raise your kids as purely Singaporean, and then we can discuss once again as to whether you are one of us. It is irresponsible for an MP to say anything which seeks to classify a citizen by the color of their skin, the number of generations of citizenship, or the country of origin. Lets face it, once the government decides to award someone a citizenship, it is our collective responsibility to treat the person as one of us. If we feel that the government is issuing too many citizenships, we should protest in a democratic way, and force the government to make the approval criteria for citizenship applications more stringent (for FUTURE applicants). Any talk of treating a person who is already a citizen as a second class citizen - is totally inappropriate - irrespective of the motives that person might have had. It was our reponsibility as Singapore government to have checked those motivations when we issued the person a citizenship. After issuing it, we can't start calling them some second class kind of person. We need to take ownership for our past actions - even as we certainly can discuss and try to drive changes in future policy. hey Pete hasn't it become absolutely boring for you here, cos it's so easy for you ( and most, if not all white people)? And to that Indian guy who is telling off Pete for not taking up Singacitizen, please wake up and smell the coffee. You're INDIAN. You're NOBODY in this country- even if you die for it. C'mon keep your mouth shut and GET ALONG TO GO ALONG. your opinion not respected. I'm Indian btw. Just telling it like I see it. THATS ALL I WANT TO SAY TO YOU"
I think in the end only those who are willing to fight kill and die for country truly deserve to be called sons/daughters of soil. Citizenship is all legality. As someone here pointed out, dual citizenship is always there. 1) !969 riots in Malaysia, some Malay soldiers went rogue. They shot at Chinese. But no Chinese soldiers to defend- why? Because Chinese hardly go into army/defense services - they rather do commerce. 2) Indians in Fiji have been there for generations- but again very little representation in the forces- again they do the commerce. The question now begs is this? How many willing to stay and fight in times of conflict. That's the true litmus test- cannot be tested until it happens. In the meantime maybe PR's pay higher taxation rates per bracket? Hey Pete- My kid girl went to Oz to get her degree and she said it was the happiest moments of her life.